Trust FTD to send your next order of roses, bouquets or plants. As the world's oldest online floral services organization, the company works with thousands of independent florists to ensure your flowers always arrive fresh and beautiful. Nothing says 'I'm thinking of you' quite like a special floral arrangement. 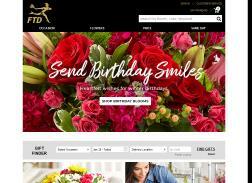 Use the FTD coupon codes below to save money on flowers and more. Save 15% Off The Red Romance Rose Bouquet From $52 Vase Included! Offer Ends 12/31/15. Shop The Red Romance Rose Bouquet From $64.99 – Vase Included! Take 15% Mothers Day flowers & Gifts. Expires on 05/31/2015. Shop our best selling arrangements at FTD.ca, starting at only $21.25, that will make anyone happy on any occasion. Shop The Vera Wang Floral Collection – Prices Starting At $59.99, Vase Included! Take 15% Off Site Wide. Expires on 05/31/2015. Save 20% On Your Entire Purchase of Flowers & Gifts. Discount is applied automatically after clicking the Get Deal button – no promo code required. Offer Ends 2/14/14. Shop Mother’s Day Flowers with prices starting at $39.99. No coupon code required. Ends 5/11/14.